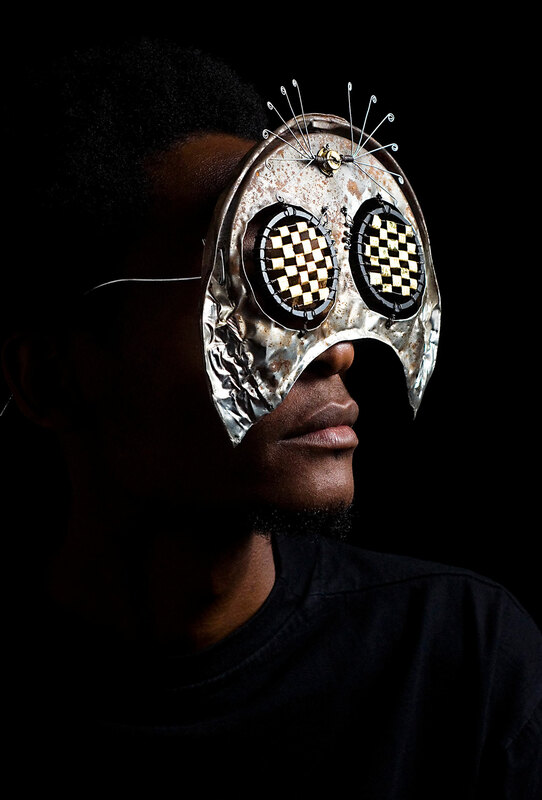 An exhibition of the C-Stunners spectacles by Kenyan artist Cyrus Kabiru is running in Cape Town, expressing the multiple, one-of-a-kind perspectives on and from Africa. His spectacles are wild and whimsical, serious and resourceful. Kabiru works with objects and recycled materials found on the streets of Nairobi. Bars evoke prisons, bullets evoke police brutality, bones and calabashes talk to tradition, wire satellite dishes and other elaborate metal constructions comment on technology and the future. Most involve many of these elements. The press release lobs Kabiru into the Afro-futurism box, a philosophy that has increasingly become an empty populist label celebrating everyone from Sun Ra to Outkast and Janelle Monáe. Kabiru is self-taught. In fact, he started making the glasses when he was seven years old and has forged his own path. A fellow at TED’s The Young, the Gifted, the Undiscovered in the US in 2013, he explained: “They used to tell their kids ‘Work hard. If you won’t work hard, you’ll be like Cyrus.’ I was very different. I was always in my house doing art, painting and making sculptures. And no one understood what I was doing. I didn’t study. I wore shaggy clothes. Aside from a selection of the spectacles and selfies of Kabiru wearing his glasses, his Black Mambas are also on show. These are sculptures made from fixed-gear bikes that have increasingly become obsolete with the advent of the scooter. As such an expression of extreme individualism and the celebration of multiple narratives – numerous perspectives, positive and negative – and a grounded presence in the now, Kabiru’s work is far more nuanced than “black sci-fi”. Also worth comparing with these C-Stunners is Cape Town’s favourite talking point, the Perceiving Freedom “public spectacles” by Michael Elion. Unfortunately, instead of being supersized and displayed in public, Kabiru’s work is hidden away in the obscure The Palms complex in Woodstock, where SMAC Gallery relocated to at the end of last year.